Did a blunder, dint properly notice that we had to CASE a card, i was inspired by Deepti's 3 tier cake box and did a similar one for my lil girls' bday. Anyway here again with a CASEd version of her CARD. Here is Deepti's card, she has used water misting technique. 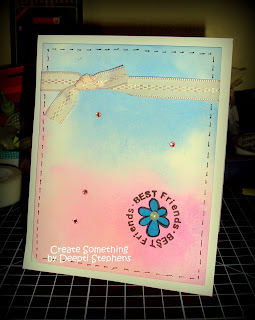 Here is my take on it, i have used water misting on distressed card. The sketch is from CAS(E) this Sketch. Am gonna update this description later, running out of time. Darling! I love the look :) Have a lovely day. Nice card Sujana. I appreciate your desire to try as many as new ideas. That's really a great way to learn. I just fell in love with your "Tri shutter cup cake card". So...lovely! Congrats on your win too! The distressed n misted bg look fab Sujana ,loved the cute banners ,beautiful card ! Neat case-ing, and stunning results. The bg is superb n loved the add on of banners...grt take on deeptis card. Love the splotchy background Sujana and that banner is adorable!